How Well Does Hair Removal Cream Work? If you are considering using hair removal cream (also called depilatory cream) on any part of your body you may wondering just how well these products work before you waste any money on them. The thing to keep in mind that each different brand of hair removal cream may work slightly differently and one may work better than another on your body. But most people do find that these creams work rather well when it comes to removing unwanted hair from the body. To get the best results from these creams you should follow the manufacturer’s directions as written so that you know you are properly using the cream in the way it should be used. To really understand how well hair removal creams work, you should have a basic understanding of how they work and what happens when you use the products. These creams may differ slightly in the ingredients and strength of the creams but most of them have the same basic process for getting rid of hair on the body. The cream has a strong alkaline chemical in it that when applied to any hair will start breaking down the hair follicle. The chemical keeps breaking down the hair follicle until the hair turns into a very soft, mushy-like hair. This process can take anywhere from 5-10 minutes depending on the strength of the cream. Once the hair has broken down, it can easily be wiped off with a warm towel. With hair removal creams, the hair follicle is broken off at the skin level or sometimes slightly below, so this does mean that the hair will grow back as this is not a permanent hair removal technique. Most people will see regrowth of the hair within a few days. When using these creams you may also want to keep in mind that a slight tingling feeling is normal, but if you experience a burning sensation that usually means your skin is too sensitive for the creams. 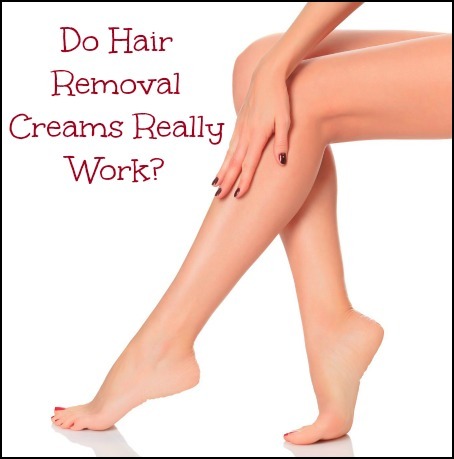 Hair removal creams do work rather well at removing unwanted hair but as mentioned this is not a permanent solution and there are some people who have skin that is too sensitive to use these products. On the hand, some women really like using the hair creams to get rid of unwanted hair because it’s easy and you don’t have to worry about things like razor burn. You can find hair removal cream for anywhere from $5-$15. If you are considering using these creams, it won’t cost you that much money to see how well it will work on your body. But, do keep in mind that you should test a small portion of your body first to see how your skin will react before using the cream all over. It is really hard to say just how well a hair removal cream will work on your body before you actually use it, but they do work and many women do enjoy using them.